"I can't really stand here and say it's going to be 'farewell' or anything like that, because nobody knows. Nobody knows what this offseason holds," Bryce Harper said Wednesday. See photos. 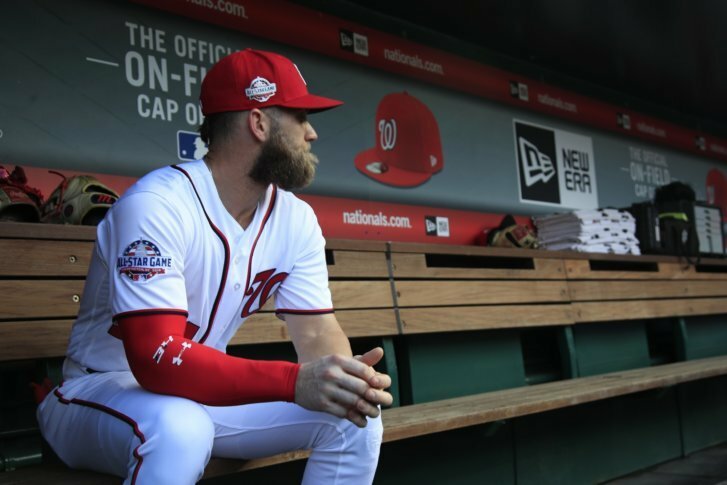 WASHINGTON (AP) — More than 3½ hours before the start of what many expect to be his last game at Nationals Park as a member of the Washington Nationals, Bryce Harper stood at his locker and let his eyes linger on that familiar white jersey with the curly red “W” on the front and his last name on the back. Then Harper, who can become a free agent at season’s end, put on his full uniform, right down to the stirrups — the only player ready that far ahead of Washington’s 9-3 victory in its home finale against the Miami Marlins, which was stopped Wednesday after seven innings because of rain. The storm arrived, naturally, as Harper stood in the on-deck circle while the last out of the seventh was recorded. He was greeted by fans’ signs, standing ovations and chants of “Let’s go, Harper!” for each at-bat while going 0 for 4 with a pair of strikeouts. If this was, indeed, a “goodbye” to Harper, consider it also a “welcome” to someone the Nationals could count on to replace his outfield production, 21-year-old rookie Victor Robles. He delivered the first four-hit game of his nascent career, including a three-run homer and a two-run double, and stole a base, to boot. The Nationals — 81-78 and, like the Marlins, missing the playoffs — close the season with a three-game series at Colorado. They drafted him No. 1 overall at age 17 in 2010, then called him up to the majors at 19. He was the NL Rookie of the Year in 2012, then a unanimous MVP selection in 2015. A team that lost 100 games in a season twice before Harper came aboard won four NL East titles with the slugger (although never won a playoff series). He sparked raucous celebrations at his home stadium when he won the Home Run Derby during All-Star weekend this July. “It’s like I’m standing here like a 35-year old, but I’m only 25. So it’s the first time going through something like this, of course. I’ve never done it in my life — possibly playing my last game somewhere, anything like that, and it really means something to me,” Harper said. Asked what it would take for him to return to Washington, Harper said: “I’ve got to know if I’m in” the team’s plans. Needless to say, folks such as Nationals manager Dave Martinez and Harper’s teammates would prefer the latter. First baseman Ryan Zimmerman thinks Harper would like to remain. As Harper wrapped up his lengthy and wistful pregame session with reporters, outfielder Adam Eaton shuffled into the clubhouse. Until it’s been determined, Harper’s 2019 destination will be the talk of baseball. In his first start in the majors, Washington RHP Kyle McGowin left after walking the first two batters in the fifth inning. He gave up no runs and just one hit. Wander Suero (4-1) got the win with one inning of scoreless relief. Marlins starter Wei-Yin Chen (6-12) went four innings, allowing four earned runs and seven hits. Nationals C Spencer Kieboom’s younger brother, Carter, was the club’s minor league player of the year, while LHP Ben Braymer and RHP Wil Crowe shared minor league pitcher of the year honors. Marlins: RHP Corey Oswalt (3-3, 6.08) starts Friday’s series opener at the Mets. Nationals: RHP Joe Ross (0-1, 4.09 ERA) pitches Friday at the Rockies.